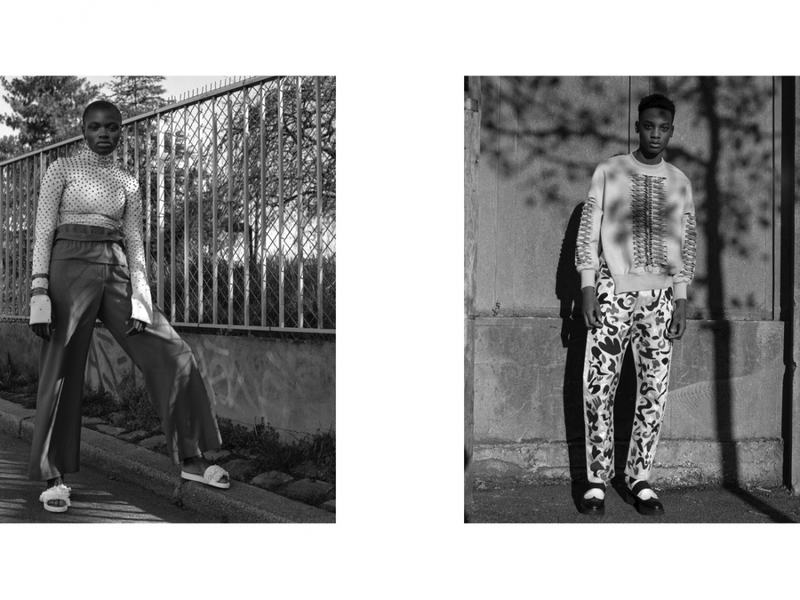 Models: Aliou Drame at 16Men and Zoe Alayrangues. Left: Dorhout Mees Top, Caralie Marabelle Pants and Shoes, Stylist's own Bracelet. Right: Manish Arora Sweatshirt, Alex Mullins Pants, Sean Suen Shoes. Zoe wears Vintage Louis Vuitton Top, Augustin Teboul Tank top, Julien David Mask, Manish Arora Skirt. Aliou wears Julien David Suit and Shirt. Zoe wears Dorhout Mees, Zana Bayne Harness, Nicolas Lecourt Mansion Pants, nasaseasons hat. Left: Nattafranco T-Shirt, Dourhout Mees Shorts, Zana Byrne Skirt. Aliou wears ABOC Suits, Nicolas Lecourt Shirt. Zoe wears Dorhout Mees top, Nocolas Lecourt Mansion Dress. Aliou wears Icosae Coat, Etudes Pants.